So. Um. 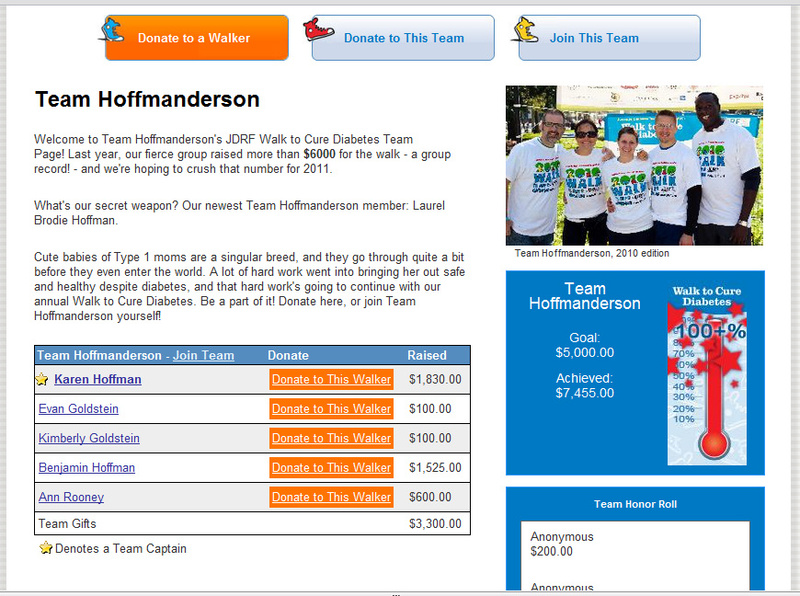 In other "recent" momtime news, 11 weeks ago today Team Hoffmanderson did the JDRF Walk to Cure Diabetes. And it was amazing. Not only was it L's first Walk (! ), we also crushed our fundraising goal. Team Hoffmanderson raised $7455 as of today, and I think that when corporate matches roll in we'll be well over $8000. Eight. Thousand. Dollars. It boggles my mind, and kind of makes me want to burst into tears of happiness. I'm lucky I have such incredible, generous people in my life. Below, you'll find some pictures that capture a few highlights of the day. (Check out my exquisite biohazard DIY stroller pennant! I hope I did Lee Ann proud.) I'm already looking forward to 2012! See that achieved section? BOO YA. First Walk to Cure Diabetes! Why yes, those ARE test strip flower petals! Love the test strip flower petals - and great job to your team on that fundraising!